Brunson Heating and Air Conditioning is proud to be a Carrier authorized dealer. Carrier specializes in creating a customized home comfort system tailored to your needs with a broad selection of residential heating, cooling and indoor air quality products. The highly qualified staff and technicians at Brunson Heating and Air Conditioning can help you select the best system for your home that includes industry exclusive, state-of-the-art technology. 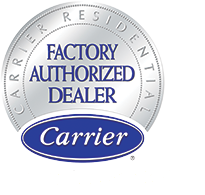 Carrier Factory Authorized dealers are experts in the heating and cooling industry. They customize the ideal system for each home or business, and are committed to meeting the customer’s needs from installation, service and beyond. Less than five percent of the heating and cooling professionals meet the standards required to receive this certification. Brunson Heating & Air brings it all to you!